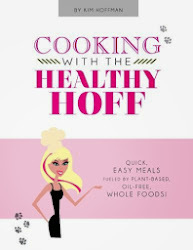 The Healthy Hoff: Free Book: "25 Amazing (& Weird) Facts About How Food is Made"
Free Book: "25 Amazing (& Weird) Facts About How Food is Made"
Raw pickles contain healthy probiotics & where to find them! Citrus-flavored sodas are made with a toxic flame-retardant chemical that's banned in over 100 countries (but not the USA). Chinese restaurant "soy sauce" is actually a toxic chemical imitation of real soy sauce. When French fries are fried, they produce a toxic, cancer-causing chemical that you'll never see listed on ingredients labels. TVP (Textured Vegetable Protein) often contains a highly toxic non-food product that's used as a commercial pesticide. 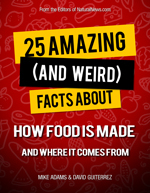 Most margarine products are actually made with dairy-derived ingredients. Gelatin, used in Jell-O and jams, is made from from the boiled skin and cartilage of cows and pigs. How a high-tech company reverse-engineered the human genome to develop chemically-targeted taste blockers and enhancers that are added to snack foods.